NOTE: This article describes the 50 year period 1943-1993. The period up to day will follow later. The Saga of the Knarr started when Willy H. Johannesen and Lars Walløe made contact with Erling L. Kristofersen, and asked him to design a new “Folkboat”. It should be an inexpensive boat for cruising and racing, Kristofersen was chosen because he had already designed fast boats. The main reason for doing this was that the Nordic Folkboat was regarded as an ugly boat in Norway. Erling L. Kristofersen finished the design for “22 1/2 m2 Lestebåt”. Kristofersen had the idea of building the boat bottom up on a fixed frame, attaching the keel after having finished the hull. Bolting the keel to the hull is today quite normal, but at that time it was a kind of revolution. To reduce the need for crew, Kristofersen did not design the boat with a spinnaker, and because of the war it was impossible to get lead for the keel, it had to be made of iron. The work on the prototype was started at Einar Iversens property at Grimsøy near Sarpsborg. He had also bought Ottar G. Larsens Boat Yard, which later on became Grimsøykilen Boat Yard, where a great number of Knarrs have been built. It was Iversen who initiated the idea of building the boat of planks with concave and convex edges, so that they fitted together at various angles. The time used for building the boat was thereby reduced dramatically. The first boat had a calculated prize of NOK 4,500 (about 2/3 of the price of a Dragon). The first boat was launched in the autumn of 1944. During the war there were restrictions on boat building (and sailing). The Germans heard about the project, and to be able to continue Iversen had to promise to give away the first boat to the Germans. However, Iversen delayed this by claiming that the prototype had to many faults, so that another boat would have to be built for the Germans. A new boat with minor adjustments was built during the winter of 1944/45. The war ended and the Germans did never get their yacht, and ON-1 was finished without any further delays in the spring of 1945. When the boat was presented at Dronningen in the autumn that year, many sailors were interested. But the reception was rather mixed, the lines were new and her freeboard higher than usual. Despite the skepticism, Willy H. Johansen was able to get enough people interested in the boat to receive a couple of orders. The first boats were delivered. 2 boats delivered. The first, ON-4 Troja 4 for Sverre Andreassen, is today the oldest Knarr. It was also available for IKC 1993. The price was now NOK 5,500–6,000, quite a lot of money at that time, but still less than other boats of the same size. This was the year of break-through for the boat, 12 boats were delivered. Grimsøykilen Boat Yard did not have capacity for so many boats, so Kilen Boat Yard in Kragerø was licensed to build the “22 1/2 m2 Lestebåt”. A naming contest was announced. Gunnar F. Klingenberg won, and the Knarr was finally given a name. As for the Dragon the Knarrs name is taken from the Viking ships, a Knarr was a Merchant Ship. The replica Saga Siglar, which Ragnar Thorseth sailed to America for the Columbus anniversary, is also a Knarr. The number of Knarrs were almost 40, and there were now Knarrs in most of the cities around the Oslofjord. Norsk Knarrklubb (The Norwegian Knarr Association) was founded on November 1st. The first Admiral was Carl Høegh. The number of Knarrs were this year 52, all delivered to Norway. The Knarr was introduced in San Francisco by Bjørn Iversen, the son of Einar Iversen, the first builder of the Knarr. Bjørn was studying at Stanford University, and Gordon Morison bought the first Knarr in San Francisco. Due to the Knarrs excellent handling of the strong breeze and choppy sea on the San Francisco Bay, it soon became very popular. It joined the company of Norwegian and Scandinavian designs as the IOD (International One Design) and the Folkboat. The first Norwegian Championship took place at Hankø. Kristian Hansen became the first champion. There had been shown much interest in the Knarr both from Sweden and especially from Denmark. The possibility of building Knarrs in Denmark and Sweden was discussed with the Commodores of KDY (Royal Danish Yacht Club) and K.S.S.S (Royal Swedish Yacht Club). The Knarr was approved as a National One Design Class in Denmark on November 6th. On January 25th. the Danish Yacht Racing Union ordered a plug from Einar Iversen, so that Børresen Boat Yard in Vejle could build the first Danish Knarr. The first Knarr built in Denmark, was launched on May 15th. It was then sold by lottery. The first Danish Admiral was Erik Dugdale with Axel Madsen Mygdahl as secretary. The Knarr was used in team regatta between Belgium and Norway with 3 teams from each country, the winner was Norway. Thee Knarr was for the first time invited to participate in “H.K.H. Kronprinsens Serie Seilaser” in Oslo with 25 boats on the starting line. The Knarr has been invited every year since then. The Knarr Class raced on Øresund for the first time, four boats participated in the Øresund Week. There were now 10 Knarrs in Denmark. The first team regatta between Denmark and Norway was held in Oslo, Norway won. 2 Knarrs were delivered to England. 75 boats with larger sails, rig and cabin (US version) were up to this year produced for the Lakes in USA. Boats from Denmark and Norway were sold to San Francisco (with the original rigging). The first 2 boats were delivered to Bergen. The first team race between East- and West-Norway was arranged, and has been an annual event since then. More than 300 Knarrs have been launched in Norway. The Royal Danish Yacht Club (KDY) celebrates its centenary. 35 Knarrs participated in the Centenary Regatta (6 from Norway, 1 from Sweden, and 1 from USA). ON-65, Irina, with Georg v. Erpecom jr. sailed from Bergen to the Centenary Regatta in Copenhagen and then to Oslo. This was, at the time, the longest journey made by a Knarr, and he was awarded th Royal Norwegian Yacht Clubs Cruise Racing Trophy for the journey. Knud Wibroe from USA, together with Knut E. Røsholm and Arne W. Kamfjord from Norway, discussed the possibility of having an annual International Knarr Championship. HRH Crown Princess Margrethe & HRH Prince Henrik of Denmark were given a Knarr as a wedding gift by KDY. HRH Prince Henrik later bought OD-71 and OD-121. San Francisco Bay Knarr Association proposed by Knud Wibroe to have an International Knarr Championship. A committee in Norway out-lined the first rules for the Championship. The Deed of Trust for the International Knarr Championship was recognised by the national Knarr authorities in Denmark, Norway, and USA. The International Knarr Trophy was produced by Th. Martinsens Sølvarefabrikk in Tønsberg, Norway. The International Knarr Championship (IKC) was held for the first time (in San Francisco) by San Francisco Yacht Club, which celebrated its centenary. The late Robert M. York of Belvedere became the first International Champion. The wooden Knarr has become too expensive to build. The number of boats built by Børresen had decreased the last years and the plug at Grimsøykilen was falling apart. Bjørn Bakke and Knut Berge (from Bergen) discussed the possibility of having the Knarr built in fibre glass and Knut Berge was given the task of developing the idea. Together with Kristian Hansen (Oslo) and Jørgen Skovsgård (Copenhagen) Knut Berge presented the ideas to Børresen in Vejle. Børresen had already been successful with the fibre glass Dragon. Børresen was willing to build the fibre glass Knarr eventhough it was not possible to obtain 20 orders for the fibre glass Knarr, which he initially wanted in order to start building. A discussion about the rights and licences arose with Grimsøykilen Boat Yard. Einar Iversen was, to begin with, not interested in letting Børresen build in fibre glass. He claimed that Børresen only was licensed to build wooden boats. After some discussion he agreed that Norsk Knarrklubb was allowed to build fibre glass Knarrs at Børresen Boat Yard. The agreement was signed in January 1973. IKC was held in Norway for the first time. Bergen Yacht Club celebrated its centenary by being the first Norwegian Club arranging the IKC. Grimsøykilen Boat Yard was sold to Sani Industri and a discussion about the rights and licences arose again. Because Børresen had been building Knarrs since 1955 he started the production of a fiber glass plug even if Sani Industri did not accept his rights to do so. Børresen built a wooden boat weighing every part. By doing this he was able to calculate the correct weight distribution for the Knarr. This boat was used as a plug for the fiber glass forms. This wooden Knarr later became OD-66, one of the best Danish wooden Knarrs. The weight of the fiber glass Knarr was controlled by weighing a number of older wooden Knarrs. The first Danish fiber glass Knarr, OD-67, was delivered to Erling Sundø. The price was DKK 55,900. The first four fibre glass Knarrs in Norway were delivered to Bergen (ON-124, ON-125, ON-126 and ON-127). The new big jib and the main sail sheeting to a post in the cockpit was approved by Norsk Knarrklubb after it had been tested in Denmark. The fiber glass Knarr was presented at the exhibition “Sjøen for Alle” in Oslo. The exhibition boat OD-75 was sold as the first fiber glass Knarr to Oslo and is today ON-128. IKC was held in Oslo for the first time (by KNS). For the first time a Norwegian won the Trophy, Lars Solberg of Bergen became International Champion of that year. The International Knarr Class Rules were assembled in a new edition. Præstø on Sjælland entered the Knarr family (7 boats). 2/3 of the Knarrs racing in Øresund were fiber glass boats. 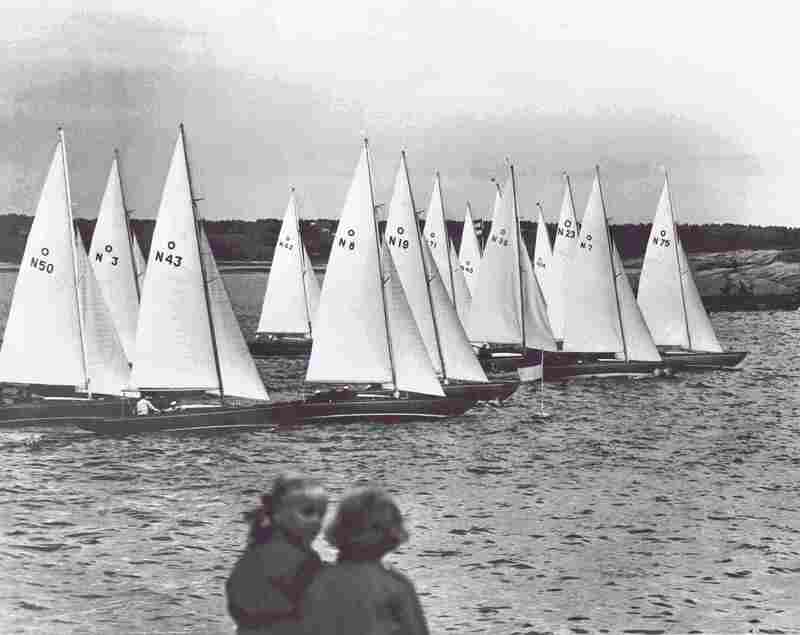 More than 50 boats were frequently racing. Børresen was building about 6–7 boats every year. Mainly for Denmark, but some were also delivered to San Francisco and Norway. KNS celebrated its centenary by having Regattas at Hankø in the Oslofjord. 29 Knarrs (including 7 from Denmark and 4 from Bergen) were again racing for Erling L. Kristofersen Memorial Trophy. The Trophy was won by HRH Prince Henrik of Denmark. HRH King Olav V was presented a half model of the Knarr for his 80th. birthday. The number of Knarrs starting in the Norwegian Championship was 33, the largest number of starting boats in a Norwegian Championship. Norsk Knarrklubb bought all rights for the Knarr on February 7th. and was thereby, for the first time, in a position to licentiate Yards to build Knarrs. A new edition of The International Knarr Class Rules with original drawings was issued. The Knarr celebrates its first 50 years and the 25th. International Knarr Championship was held in Oslo. No other One Design Class has an unbroken series of Norwegian Championships over as many year as the Knarr — every year since the first in 1954. The Knarr can therefore be considered one of the most successful Norwegian Yachts ever designed. “The joy of sailing is a boat, as beautiful as the Knarr”.